Kelechi Bradley is the inventor of the CWK Plates which I covered in an earlier post – Hair Straightening without Any Heat. NOFH: Can you tell us more about you and what you do? 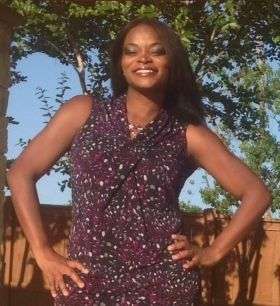 Kelechi: My name is Kelechi Bradley and I reside in Humble, Texas. I’ve been married for 12 years and a mother to two boys (ages 9 and 11). I’ve worked in education for years and currently, I’m a middle school counsellor. I’ve been doing hair on the side for years and I’ve always been intrigued with the beauty of hair. NOFH: Are you natural or relaxed? What’s your hair story? Kelechi: I have been natural for over ten years, but I never saw much growth because I constantly had to trim due to heat damage. I vowed a year ago to divorce my flatiron :-). NOFH: How did you come up with the idea for the plates? Kelechi: After I decided to box up my flatiron and divorce the heat, I had to find something else to satisfy my needs. After extensive research, I was unable to locate the right tool to give me the straight sleek look I was going for, so I decided to create one myself, and now the CWK Straight Plates are a reality! NOFH: How long did it take for you to go from an idea to breathing life into the idea? Kelechi: I have been playing around with the sketch for about a year. I found a manufacturer to develop prototypes of the CWK Plates about six months ago. After receiving the quote from the company, I decided to get a little help on the tooling and production by starting a campaign on Kickstarter. Backers give me the support I need to get started and CWK Girls everywhere have the opportunity to get a set of plates before they officially hit the market, a win-win situation for everyone involved. NOFH: How long does it take the hair to dry without heat while in the plates? Kelechi: Drying time depends a lot on the thickness of the hair. My hair takes about two hours to completely dry without heat, but my hair is pretty fine. NOFH: How long does the straightened hair usually last? Kelechi: I usually do my hair over the weekend. As long as I wrap it at night and the Houston humidity isn’t crazy, my hair stays straight for a week. NOFH: What material are the plates made out of? Kelechi: The plates are made out of polypropylene. This is a hard, sturdy plastic that can withstand heat (if required). NOFH: Is it ok to use the plate with any products such as leave ins, natural oils, serums, etc? Kelechi: It’s okay to use any preferable hair products with the plates. These products won’t damage the plates but don’t be too heavy with product application so your hair isn’t weighed down too much. Personally, I like to use my favourite setting and foam wrap lotion to set my hair in the plates. NOFH: Any particular dos and donts regarding use, storage and care of the plates? Kelechi: The plates are pretty sturdy and can withstand usage over the years. They are basically flat rollers, so I would suggest using the same care used for magnetic rollers and other hair tools. Kelechi: That is a great question! I am going to send out the plates in the order that the pledges were made. Right now I have over 400 orders to fill with 10 days left, so my team and I will be super busy this summer getting the orders out. So the best answer to the question is, the sooner backers make their pledge; the sooner they will receive their order. NOFH: When will the plates officially hit the market after the first run in August/September? Kelechi: The next set of plates will only be available from November onwards. NOFH: Are you working on any other inventions for hair? Kelechi: I have a few other inventions in mind that will all be a part of the brand CWK Girls, focusing on no heat solutions for healthier hair. I promise you will be one of the first to hear about it when I am ready to launch the next project. NOFH: Any advice for other budding entrepreneurs? I can’t tell you how many great ideas I had previously, which I never moved forward with and the disappointment I felt when I saw my idea on TV or online. I have learned over the years that you never succeed by dreaming, but by doing. Don’t be afraid to fail…that’s the only way you can succeed. The Kickstarter campaign closes in 10 days. If you would like to back the project, visit the campaign page HERE. You can stay connected to Kelechi online through instagram@cwk_girls, twitter@cwkgirls & facebook@CWK Girls. Update: The inventor has hit a snafu since this was published and the plates are now on hold to deal with patent issues. They will be issuing refunds to everyone who invested in the plates. Hopefully, she will be able to relaunch in future. There is an extensive thread on LHCF with updates from Kelechi in there as well. You can read it up HERE. We wish Kelechi best of luck. Did you enjoy the interview? To stay updated on new interviews, sign up to the newsletter below for tips, discount codes, exclusive entries into giveaways and copies of my free e-books.